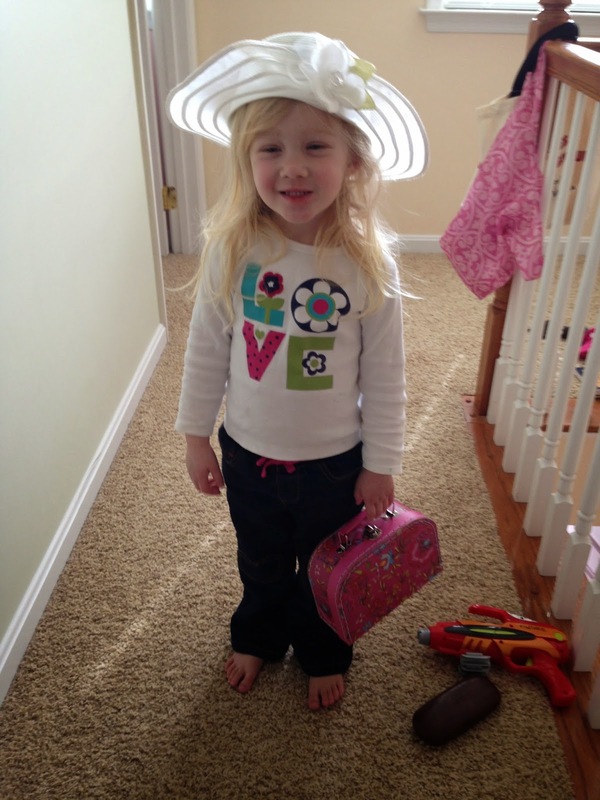 A suitcase and a hat are all she needs today. Her suitcase contains very important items. It has her make-up set. Kid friendly it is everything a little girl wants but without the danger of real make-up. What I find interesting is that she will not put anything else in that suitcase. Just her make-up. She is a single focus gal. The old Easter hat from years ago has found a new person. Little hat oh how you have been a part of the many costumes in this house. Adelynn loves this hat very much. She wore it to school, she wore it to the playground, she wore it to church, she wore it to supper. Happily wearing it as she played all weekend long. You never can tell how long an item like an Easter hat will be in vogue with a three year old but maybe this hat will last through Easter. A worn hat always goes well with a smile.